Q. Is this an ‘orb’ in my photo? A. No, probably not. We are happy to review evidence that people present to us regarding anomalies in photos, but the vast majority do have perfectly natural explanations. If the photo was taken with the assistance of a camera flash or in a dusty environment the camera will pick up dust illuminated by the flash that is too close for the camera to focus on – hence a semi transparent ‘orb’. We experience this constantly during our site-investigations and can always be traced to sources of dust. A. A ghost is thought to be the ‘spirit’ or some other vital essence of a deceased person. Typically the ghost, or a haunting is the result of a premature death or a violent death. A violent death is believed to cause a strong emotional energy to be imprinted in the environment where the death occurred. This ‘imprint’ can than replay itself spontaneously or be picked up by individuals that are sensitive to this type of energy. We are using a very loose definition of energy here, because if it exists, it is not known or detectable by current scientific instruments. However, reviewing the cosmological literature about the physical makeup of the universe reveals that scientists don’t really know what 75% of the universe is made up of. Only 25% of the matter in the universe is made up of visible matter like the atoms that we are made of. The remainder is termed dark matter and is not detectable by current scientific instruments. As well as a violent death, another thing that can anchor a spirit to the physical plane is the death of an individual who has not completed some task of strong importance to them while they were alive. For example, an American hotel is haunted by a benevolent lady who died while waiting for her love to sail back. A. Scientifically, the existence of ghosts has not been confirmed. There are a number of theories about both external environmental conditions that can cause a person to experience ghost like phenomena and also internal psychological aspects of individuals that may predispose them to perceive ghost like phenomena. External conditions may include strong magnetic fields such as wiring in or around the building, or more importantly changing magnetic fields that can sometimes cause feelings of a ‘sensed presence’ ie. that there is someone in the room with them. The problem with these theories is that none are able to satisfactorily explain all the aspects of a ghost or haunting. Q. How do I know my house is haunted? A. First it is important to note that your house may not be haunted in a paranormal sense. There are a number of possible natural explanations for reported experiences. Animals seemingly reacting to nothing – eg. Cats or dogs suddenly displaying defensive behaviour for no apparent reason. All of these experiences may have a natural environmental explanation. It is important to rule out natural causes before focusing on the paranormal. For example, unusual noises such as footsteps could be attributed to possum activity on the roof or rodents in wall cavities. Some visual manifestations have been experienced as a result of very low frequency sound waves which temporarily cause disturbances to the periphery of ones eyesight. It is important to not rush to conclusions and to have the local environment thoroughly checked. Q. What does an investigation consist of? A. An investigation is designed to achieve two things: 1) Inspect the local environment for any possible mundane explanations for the reported activity and 2) Monitor the environment for a period of time (usually overnight) to try and pick up and record the activity using a range of equipment. a small team of investigators meeting with owner/resident of the building and getting a detailed history of the experiences reported there. Making a note of the building characteristics such as possible sources of drafts, electric wiring etc. Placement in strategic locations of recording equipment such as magnetic field monitors, temperature sensors and video recording equipment. Overnight (or day) monitoring of the building/location by team members in a systematic and controlled manner. Conducting Vigils – which attempt to establish contact by simple conversation with an ‘entity’ should one be present, in order to facilitate any ‘paranormal’ activity. Packing up of equipment at the end of the investigation and debriefing the owner/resident about the investigation. Review and analysis of all recorded data for any anomalies missed during the investigation. Generate a summary of findings which is presented to the owner. Q. Should I have my house blessed? A. There is no harm in blessing a house in a manner that befits ones religious or spiritual beliefs. This can provide peace of mind and help ease psychological factors that may influence any activity. However if the location is already haunted, there has been little evidence of a blessing being able to stop the activity permanently. Often the activity may subside for a short period of time (weeks) before coming back. Q. How can I get rid of a ghost? A. There is no sure fire way of ridding a house of a ghost. The more common ways of blessing a house or smudging using white sage has a calming effect on the location for a short period of time. However most cases result in the activity coming back again. Simply trying to find out the underlying cause of the activity, that is, what the unresolved issue of the spirit is, can often help. By helping the spirit with it’s problem the activity may cease. However, most cases of haunting or ghost activity does not provide a resident with enough information on the problem. If the activity is not malevolent, and there is no negativity towards the residents by the spirit or ghost, it often helps to simple speak with the ghost to reassure them that you wish them no harm and that you’re happy to live with them there. It is generally believed that most ghosts or spirits do not know that they are deceased. Some mediums and sensitives have claimed to successfully move these entities on by gently making them aware of their death and their need to move on. With negative and malevolent entities, activity can be reduced by showing aggression towards them – letting them know that you are the owner of the property and that you will not be bullied. I think my house is haunted, Can there be a logical explanation? It is always important to eliminate all natural explanations before concluding that a location is haunted. After objective analysis, most locations are found to have perfectly natural explanations for the reported experiences. It is important to have the location checked out properly. Q. What environmental factors may influence the perception of ghosts? Magnetic field fluctuations. Magnetic field changes of the earth’s magnetic field may be able to influence a person’s brain activity to generate a perception of a sense of presence. Some work performed by Michael Persinger, at Laurentian University (Canada) has been able to induce both positive and negative emotional experiences based on stimulation of the temporal lobes of the brain using magnetic fields with a strength in the order of the earth’s magnetic field. Electrical wiring in the house – this may cause strong magnetic fields immediately next to walls and fanning out to perhaps half a meter. Passing through this field may have a similar effect with unusual subjective experiences as for point 1 above. Thunderstorms, particularly approaching thunderstorm fronts and receding storm fronts have a change in electrical potential between the charged clouds and the earth. Again this may cause fluctuating magnetic fields. It is also possible that the magnetic fields may sensitise some unknown faculty of the mind that makes one more perceptive to genuine haunting phenomena. Infrasound. Low frequency sound waves, generally below 20 Hz have been demonstrated to cause feelings of unease and are also believed to be able to cause visual disturbances at the corner of ones eyes. Experiments with infrasound at concert halls resulted in individuals reporting feelings of discomfort and unease, some to the point where they had to leave the theatre. Infrasound can be generated naturally due to wind, but also by manmade sources such as airconditioning systems and other motors. Darkness – Due to the reduced amount of information, mundane noises, movements and shadows are more likely to be perceived negatively, as fearful or even paranormal if the individual is already primed to believe the location is haunted. Wind – Wind gusts and even breezes when entering a building through cracks can cause sudden shifts in temperature. Wind gusts have been known to cause windows to rattle in older houses that to visitors could be perceived as footsteps. Animals – Animals can be the source of a wide variety of noises. Possums, walking over roof tiles or tin can sound remarkably like human footsteps. Possum vocalizations can include low growls, screams to deep breathing. Koalas walking along the ground have also been misperceived for human footsteps. Mice and rats tend not to vocalize but within walls of a house can cause numerous scratching and movement noises. Q. My animals constantly stare at walls or bark at thin air, Is that a ghost? A. Animals such as cats and dogs generally have a greater sensory sensitivity than humans. Cats have far superior low level visual sensitivity, and probably higher hearing sensitivity. Dogs have superior smell and hearing to that of humans. It is possible that an animal staring at walls could in fact hear something in wall cavity (eg. rodents) or on the other side. Each animals reactions have to be taken into perspective based on their individual personalities. However, animals displaying fearful reactions and defensive postures when there appears to be no visible threat could be an indication that they are picking up something unusual. Unusual could consist of either naturally explained factors such as magnetic field fluctuations, or less mundane causes. Q. I feel like someone is watching me in my home, does that mean it is haunted? A. Magnetic fields can be responsible for feelings of being watched. Generally very strong magnetic or electric fields are required such as those generated by electrical mains, or incorrectly shielded cabling. However even weak fields when oscillating in biologically meaningful ways can cause feelings of being watched are an invisible presence. Natural explanations may be ruled out if the feelings are present without any detectable electric/magnetic fields. Q. What can start a haunting? A. Death is the usual initiation of a haunting. However, past experience suggests that individuals may unwittingly ‘invite’ unwanted spirits (human or non-human), through séances and Ouija boards. These may be psychogenic causes where the expectation of the individuals may cause them to start experiencing paranormal activity. Alternatively the use of séances and Ouija boards may genuinely cause some form of connection with something unknown. There have been instances reported spiritual presence caused by the death of a relative. Therefore, the location is not haunted as such but the spirit of the family member may have attached itself temporarily to a family member or a close friend. A. Ectoplasm is a visible physical substance that emanates from spiritualistic mediums during communication with the dead. It is believed to be a type of spiritual matter that can be used to manifest spirits of the deceased. 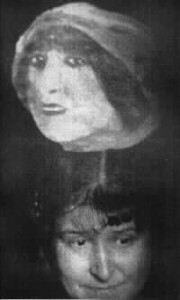 Ectoplasm was very popular during the late 19th and early 20th Century when photography became more accessible to the masses. 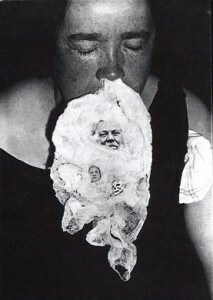 Ectoplasm was largely discredited as a fraudulent phenomena, produced by gauze and other materials concealed by the medium.